Sewing for Shay Shay, she’s only Miss Sink the Pink 2015! I’ve recently been sewing drag for Shay Shay, one of London’s freshest and most creative performers. Gorgeous US-born , London-based Shay Shay. To clarify I didn’t make any of the looks below. Let’s focus back on Shay Shay for a minute here. Shay Shay’s performance was a triple delight starting with an excerpt from the Evil Queen in Snow White, moving on to a Marina and the Diamonds song and ending with, oh go on guess. Fruit hat. Fruit. Hat. And isn’t that hat perfect? Multi-talented is Ms Shay Shay. She lip synchs, she dances, she makes fruit filled hats. She also cat sits my cats on occasion. For this look I made a full circle skirt and a bra top. So far, so big deal, right? I’ve made them before, just a bit of maths and a bit of string. It’s really the fabric doing all the work and Shay Shay’s styling that really makes this. The main difficulty was finding fruit print fabric in early April. 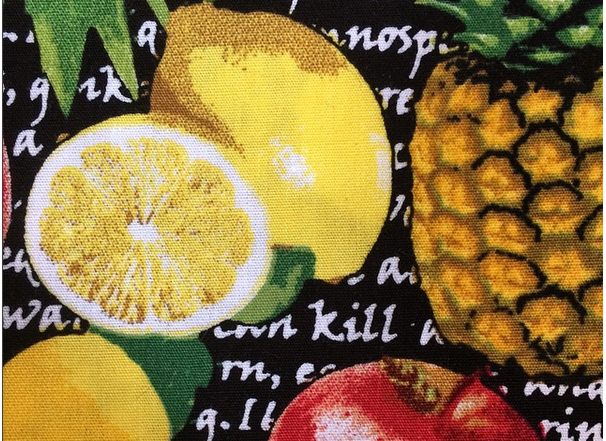 You can barely move for lemon/pineapple/watermelon print in summer but you try finding bastarding mixed-fruit print fabric out of season – cherries don’t count, in the context of fruit print fabric, they’re perrenials. After much trawling of Goldhawk Road, I finally found two perfect prints (thank you shop two doors down from Classic Fabrics). The only other issue was finding the space to lay out and cut the skirt. There’s quite a lot of it. So much, she had to have a lie down. Lazy mare. Photo by Michaela Kidd – many thanks to Michaela for this photo shoot! The other shots I’ve used here are my own (inferior) iphone pics taken on the same day. I know, right? Try finding that at 1am in the flat on your own after a horror film (don’t judge, they help me sew) binge. Seriously, that’s pretty creepy. But hey, the top looked good and it held onto the oranges stuffed in there until they were needed. And so, onto the circle skirt. 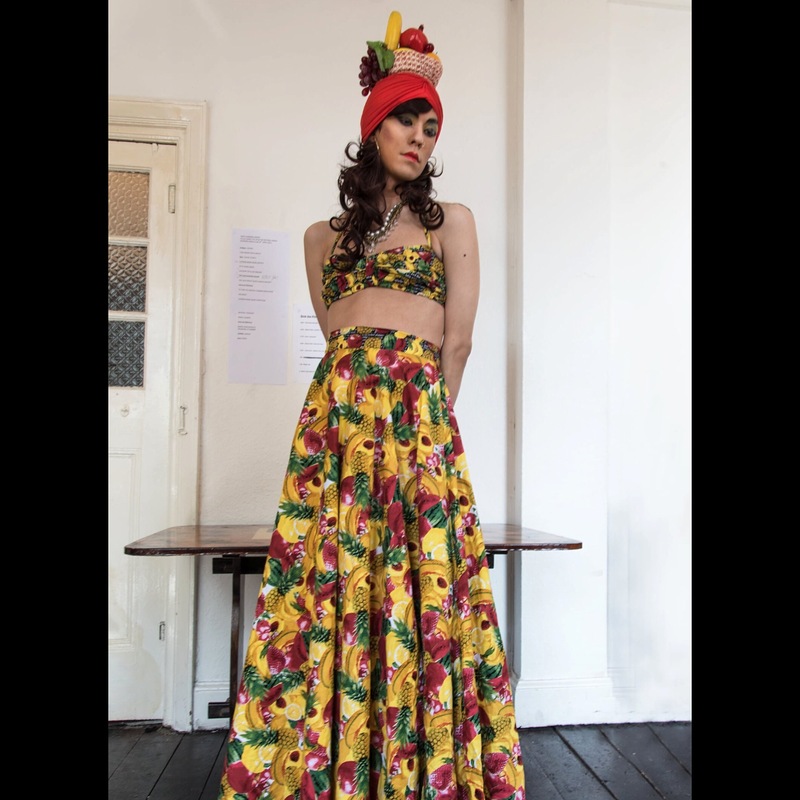 So you’re thinking ‘a circle skirt? Is that it? really?’ Well, no, it’s not actually. That huge skirt and all it’s fruity fullness tucks up into this polka dot bubble skirt. Like so. That reveal was SOOOO much fun and so satisfying to see it on-stage. Shortly after this show, Shay Shay went on to win the annual Miss Sink the Pink, in (amongst other things) a catsuit I made but that’s a story for another time. If I could draw, I’d fan art the hell out of that face. *Eventually I’ll upload the entire clip of the performance. 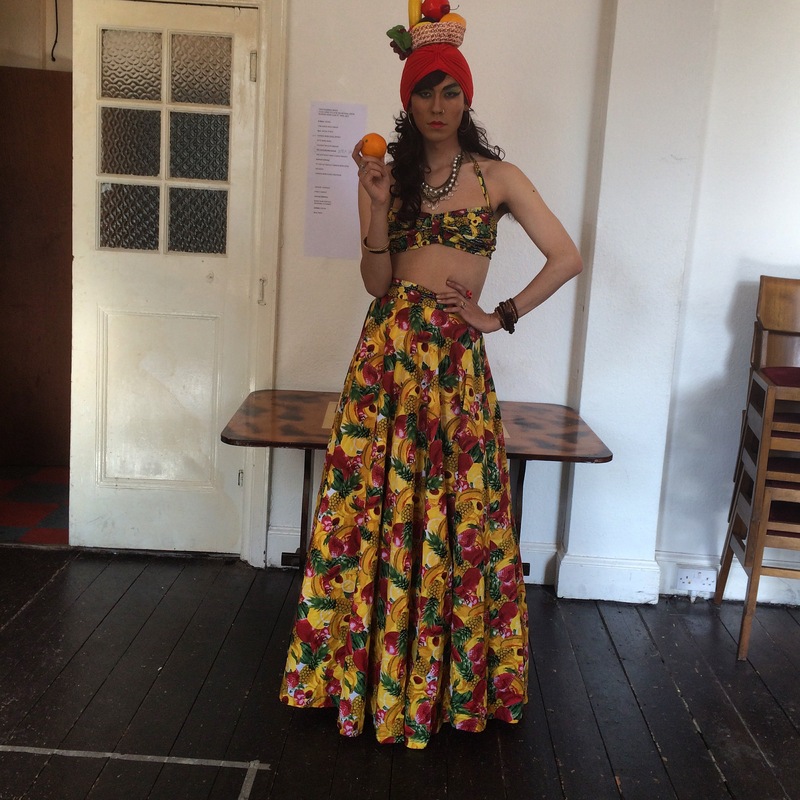 This entry was posted in Costumes and tagged bubble skirt, Carmen Miranda, circle skirt, costume, costume reveal, costumes, drag, sewing. Bookmark the permalink. 7 Responses to Sewing for Shay Shay, she’s only Miss Sink the Pink 2015! That reveal is brilliant! Congrats on miss sink the pink shay shay! my five-year old saw the picture of all the performers together and was “oooo… it’s cruellaaaa… and the evil queeeeeen… and maleficent” (i see maleficent…) Stamp of glam approval from Ileana! hahaha! Wait til the Winter Ball later this year, lots of characters coming up!